Flip Flop! 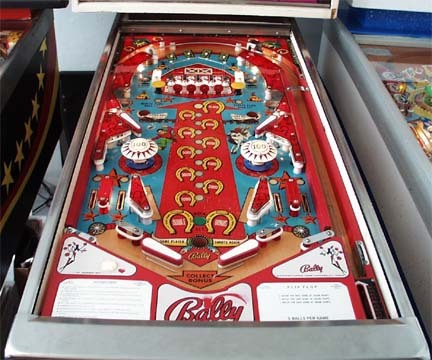 was made by Bally in 1976. I acquired this machine on December 17, 2000 from a classified ad in the newspaper. It worked, but about half of the switches were stuck, the bonus didn't count correctly, the scoring reels were gunked, and you couldn't advance past second ball. 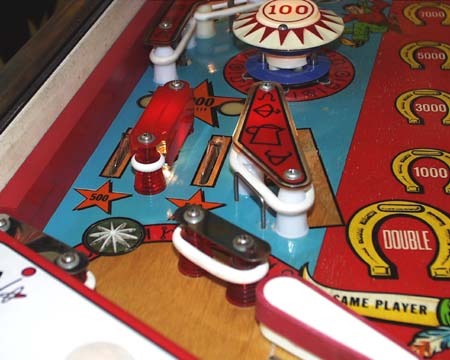 The playfield was slightly damaged, and the playfield glass was missing, but aside from all that it was in FINE condition! It has a Western/Cowboy cartoon theme, and is evidently somewhat popular in the west. I heard that when Phil Jackson had his new house built in the desert, this was the ONE MACHINE he had to have in his gameroom. Whoopee. 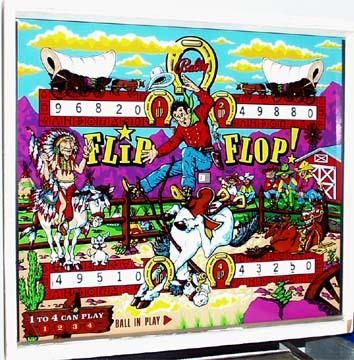 Anyway, this is one of three game to feature 'flip flags', which are domino-sized 'chips' that are flipped back and forth when certain targets or switches are hit. The reliabilty of operation of this feature is somewhat less than perfect from my experience, which I guess is why it wasn't more widely used. This game has very unusual outlane setup, which makes trapping the ball without draining very difficult, and makes the game very reflex-oriented.. And with the pop bumpers in the lower playfield, the play can become quite frantic. When I bought this machine, the first thing I did was to completely strip the playfield. I didn't even play a single game, or even turn it on. 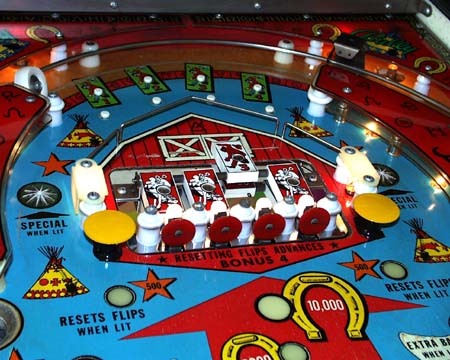 The playfield had been water-damaged, and the grain was raised. The paint was still mostly affixed to the wood, but with much play it would begin to wear away. 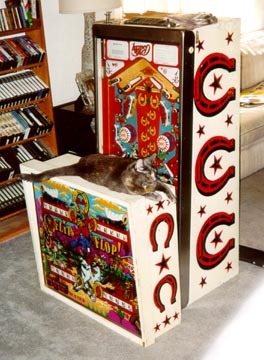 The only options were to replace the playfield, or to coat it. Since I didn't happen to have another Flip Flop playfield laying around (although I did bid on one on eBay), I figured I didn't have anything to lose by clearcoating the one I had. Following instructions I found on the Web, I stripped the entire playfield of all parts (two days work), scrubbed the heck out of it, and applied EIGHT COATS of polyurethane, over eight days. The hardest part was waiting three more weeks for the stuff to cure. I then put it back together, then did two more weeks of mechanical repair before it was fully functional. I still have some bothersome occasional flipper weakness, but it's pretty much done now..
Like the Galaxy machine, this one is no longer in my collection. It turned out to be kind of a secondary machine, seeing less play than the other three I had at the time. It's an interesting enough game, but it lacked some sort of appeal to me and Diane. I can't really put my finger in why, but the floor space would be better used with something else. Sold to a guy in Salt Lake City on October 1, 2001. He was looking for this game specifically, so everything worked out great! Flip Flop! backglass is in perfect condition.. Here are the flip flags, and the unusual outlane setup. On this game, the outermost lane is the most desireable, since the ball will usually bounce onto the flipper. The inner one is almost always a drain. Trapping the ball is almost out of the question. Here's a picture from when the machine was disassembled and ready for pickup. The cat was reluctant to let this one go!